Friday’s strongly bullish wide spread up bar on the silver chart confirmed our analysis of last week that any breakout for spot silver prices would be to the upside although Friday’s close did just fail to break the $25 per ounce level. 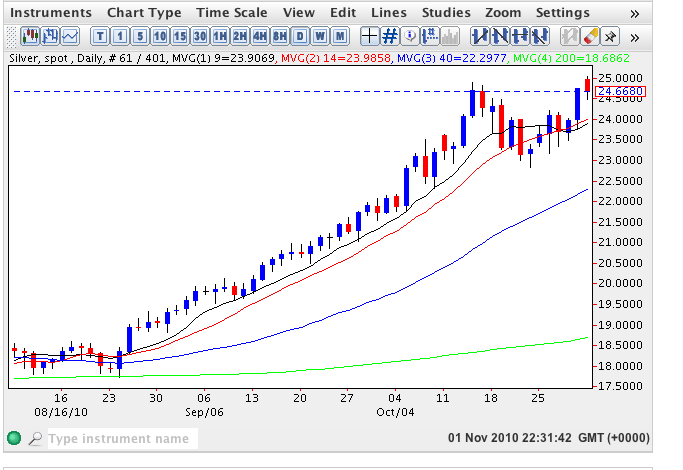 However, this was duly achieved in today’s silver trading session which took the price to an intra day high of $25.04 per ounce before falling back to trade at $24.63 at time of writing. Today’s minor pullback in spot silver comes as the result of a slightly stronger US dollar and the market’s reluctance to move higher ahead of tomorrow’s mid term elections in the US and Wednesday’s crucial FOMC meeting at which the FED is expected to announce its plans for the next phase of quantitative easing. If, as expected, the FED goes ahead a programme of bond purchases market reaction will be measured in the US dollar which is expected to fall sharply with a consequent rise in equities and commodities. From a technical perspective our price target for spot silver remains $26.50 before the end of the year with both the weekly and monthly charts fully supporting this bullish view.